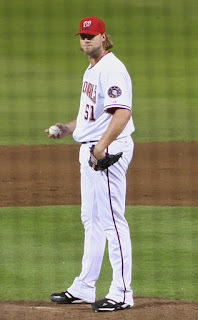 The following is a list of the tallest players to ever play Major League Baseball (MLB). Interestingly, and not too surprising, every player on the list is a pitcher. I'm also listing one player who could make the major leagues who would become the tallest player in major league baseball history if he ever make it to the major leagues. I've listed the player at the end of the list. 1. Jon Rauch - 6' 11"
Relief pitcher Jon Rauch was the tallest player in Major League Baseball history with a height of 6' 11". Rauch pitched in 556 games in his MLB career going 43-40 with a 3.90 ERA and recording 62 saves as a reliever. He was last active in the major leagues in 2013. Rauch pitched for six teams in his 11 year career and made almost $16 million in salary. 2. Eric Hillman - between 6' 10" and 6' 11"
Eric Hillman pitched for the New York Mets from 1992 to 1994. 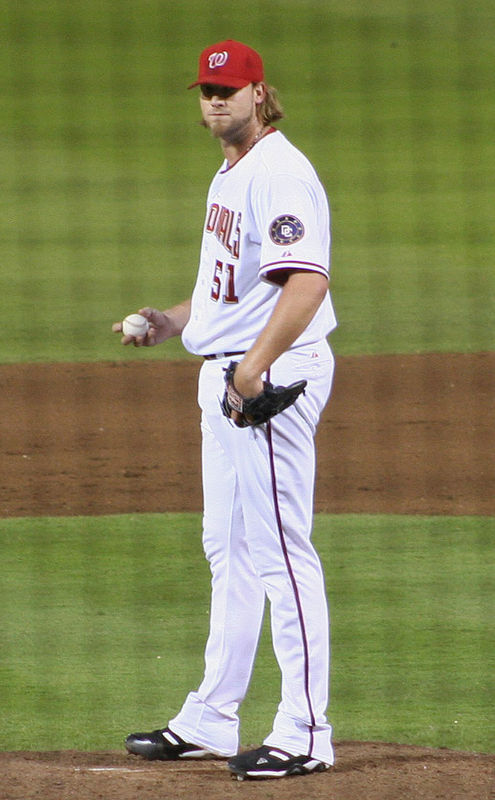 Hillman is listed in various places as being either 6' 10" or 6' 11", so he must be between the two heights, making him the second tallest player in Major League Baseball history. T-3. Randy Johnson - 6' 10"
There is no doubt about who the best tallest player in Major League Baseball history is. That distinction belongs to Randy Johnson, who won 303 games, while pitching to a 3.29 ERA in his great career. Randy Johnson is 6' 10" tall, and he used his tall frame to record 4,875 strikeouts in his career. That is the second highest total in Major League Baseball history, trailing only Nolan Ryan's total of 5,714. T-3. Chris Young - 6' 10"
Starting pitcher Chris Young is also 6' 10" tall. So far in his MLB career Chris Young has a record of 79-67. T-3. Andrew Cisco - 6' 10"
Reliever Andrew Cisco, who 6' 10" tall, pitched in the major leagues from 2005 to 2007, without much success. Cisco was as wild as a pitcher can be, as he walked 93 batters in 151 innings pitched. His career ERA was 5.18. T-3. Andrew Brackman - 6' 10"
Andrew Brackman, who also stands 6' 10" tall, pitched in three total games in the majors in his career, all for the New York Yankees in 2011. Brackman has been out of baseball since 2013 and he pitched to a 6.88 ERA in three major league games he pitched in. Loek Van Mil, who is 32 years old and stands 7' 1" tall, has pitched in the minor leagues for 11 years. Van Mil's career ERA in the minors is 3.48, so he might get a shot at pitching in the major leagues one day. If he ever does make the big show, Loek Van Mil will become the tallest player in Major League Baseball history. I'm pretty sure that Loek Van Mil is the tallest player in minor league baseball history.